New Super Mario Bros. U is an extraordinarily important game. It's the flagship title for a new piece of gaming hardware. It's the first-ever high-definition Mario. And it's the Wii U's first system-seller, one of the big games that Nintendo hopes will convince people to buy their innovative, unusual new console. It's also just another Mario game. Not that "just another Mario game" is a critical description; Mario games are consistently delightful, charming, and fun to play. But New Super Mario Bros. U is the fourth game in the New Super Mario Bros. series, a set of 2-D platformers that have all blended together in my mind, mostly because they all follow the same exact rules. Levels are always short and full of secrets—star coins, power-ups, hidden exits. Every level has a mid-point flag that's sort of a de-facto save point, and it always turns Mario big if he's small. There's always a desert world, an ice world, a final, lava-filled world where magma falls from the sky. Every world has a mini-boss and a regular boss. Those bosses all take three hits before they go down. Bowser always kidnaps the princess. Just a few months ago, I played and reviewed New Super Mario Bros. 2 on 3DS. I called it a bedtime story, noting that while you always know exactly what you're gonna get in a New Super Mario Bros. game, what's exciting is the adventure. What you find along the way. Now here&apos;s the story of a guy named Mario. But you can only listen to the same story so many times. When I loaded up New Super Mario Bros. U on our office's fancy new Wii U this past weekend, I found it tough to stay interested. I had played New Super Mario Bros. 2 in August. Did I really want to jump and hop on the same enemies, in the same worlds, using the same power-ups I used just three months ago? WHY: Because, like most Mario games, it never stops feeling fun. What I played: Spent 8-9 hours completing the game, testing out multiplayer, and scouring the world for hidden secrets. I've never played a Mario game this gorgeous. The GamePad adds clever new ways to play both alone and with other people. Not a whole lot we haven't seen before. Some nauseating platforming moments if you're using the GamePad as your screen. Sure, this one's pretty, maybe the prettiest Mario game you can play without plugging Mario Galaxy 2 into an emulator. Gorgeous backgrounds—like a stunning, watercolor-painted swampland in one of the game's latter stages—ensure that there's always something pretty to watch as you play. The plumber does well in high def. But New Super Mario Bros. U feels old, even as it looks new. In many ways it feels like a remix of Super Mario World and Super Mario Bros. 3—two of the best Mario games, yes, but they were great because they were original. They were smart, and clever, and like nothing we had ever seen in gaming before. New Super Mario Bros. U is smart, and clever, and completely traditional. Baby Yoshis? Ground-stomping sumo wrestlers? Airships filled with dangerous traps and wrench-throwing moles? Worlds named after food? Sometimes it seems like a Family Guy episode: "Oh hey, look, another reference to something from the 90s! Nostalgia!" What's really new here, of course, is the fact that you can play this game on the Wii U's tablet-esque GamePad, an exceptionally comfortable device that feels fantastic to hold and use. You can play on your TV while controlling Mario on your GamePad, or turn off the big-screen to play on the small screen in your lap (my personal preference). This choice won't affect your single-player experience much (with one rare exception—for some sections you have to tilt the controller in order to move certain platforms, which can be totally nauseating if you're looking at the controller's screen while tilting it). It's actually rather surprising just how traditional a Mario game this is, considering the trappings. What's really unusual is the way that the GamePad can be used for multiplayer. When you're playing with other people, one person can tap on the GamePad to conjure up helpful little blocks to save—or annoy—their platforming comrades. Good timing and communication here can make your life much easier. This multiplayer requires an interesting sort of coordination that Kotaku editor Stephen Totilo has compared to a synchronized jazz performance. It's a fun way to spice up the standard campaign, but it's even more fun (and challenging) when you open up some of the optional modes that task you with navigating through tricky courses and obstacles. One stage, for example, forced Stephen and I to work together to circumvent a maze of nasty piranha plants—as I jumped, he'd have to draw platforms to get me out of harm's way. It's difficult, exasperating, and a great deal of fun. So, okay. There are two questions you are probably wondering, two questions that I would be remiss not to answer. 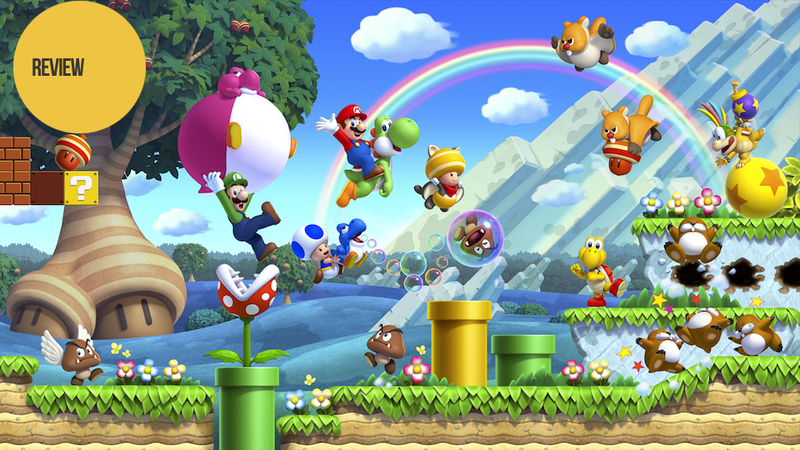 The first: is New Super Mario Bros. U worth playing? To which I say absolutely. It's gorgeous and fun to play, and although you might want to give it a while if, like me, you just played New Super Mario Bros. 2, it's still a lovely game. But is New Super Mario Bros. U worth buying a Wii U for? I really don't think so. This is not a killer app, like The Legend of Zelda: Twilight Princess was for the Wii so long ago. It's not the type of game you must play. It's a standard Super Mario Bros. game, easily consumable and always fun, even when it doesn't feel super fresh. It's just another Mario.